10: lavender. i've had my little glass jar of penzeys french lavender for months, and while i've been making lavender lemonade like a lavender-lemonade-making machine - for picnics in jersey, for experimental cocktails, for pouring over my head while i make high-end conditioner commercial faces - i hadn't actually cooked with it. of course, these lavender lemonade binges sort of mean that the ingredient is no longer one i haven't used before, but let's not go overboard. 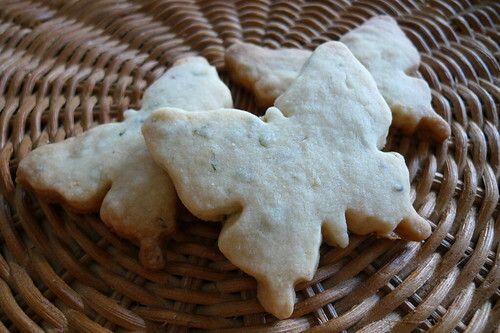 in the spirit with which i came up with the item in the first place, i made lavender shortbread cookies, and they're great. they taste like a high-rent version of the royal dansk danish butter cookies that'd materialize at extended family christmases when i was little. i am semi-seriously considering having a tea party. [W]hen you sing in English, you may be blasting through the language barrier to reach a wider audience, but are you not abasing yourself before the Anglo-American cultural hegemony that the competition is clearly designed to rebuff? There is, of course, a middle way, as taken by the Israeli-born Carmela Corren, who sang for Austria in 1966, and changed gear from German to English halfway through "Vielleicht Geschieht ein Wunder" ("Maybe a Miracle Will Happen"). Historians of Eurovision argue that the miracle has been waiting to happen ever since the same country dispatched Bob Martin--again, not the most wistfully Viennese of names--to the competition in 1957, with his bottom-ranking ballad "Wohin, Kleines Pony." The final act, from Turkey, tried to rough things up with a dab of hard rock, but they sounded like a school band, and the angry stripping robot at the back, who sawed off her own armor in a shower of sparks, missed her cue. As a pièce de résistance, she was meant to yank off her silver helmet to show her golden tresses, but it fell off early, and she was reduced to holding it up shyly to the cameras, like a little girl showing her parents the cup she just won for Best Handwriting. It is a matter of tradition, almost a matter of pride, that Cyprus awards its twelve points to Greece; they would give twelve points to Greece even if the Greek entry consisted of an elderly Cretan slapping an octopus against the side of a wharf. Recent obligations also play a part; Greece itself received twelve points from Germany this year, which was Germany's way of saying sorry for bailing out the Greek economy to the tune of only twenty-eight billion dollars. i'm so glad we're together, anthony lane. 01 any cookie recipes i should know about? this will be a fancy tea party, you see, with a variety of cookies. 02 were/are you a fan of ye olde tinned butter cookies? 03 have you ever watched eurovision? 04 are you with me on this anthony lane thing? i mean, you guys. 01 Russian tea cakes--those off which I inevitably inhale, then choke upon powdered sugar before exacting a satisfying, tea-dunking revenge. The powdered sugar haunts whatever I happen to be wearing. Also, slightly burned sugar cookies. 02 I wasn't in my youth. These days, I cannot get enough of them. I'm also fond of the tin, the contents of which my grandmother would pair with her midday Lipton sometime after The Price Is Right but before Bewitched. We preferred Otter Pops. 05 TEA PARTY + APARTMENT TENT. Just saying. 01. Do you really have to ask? My mind is overwhelmed with possibilities. Sandwhich cookies are a must, in some form. 02. Am. Am a fan. But I also like to eat such holiday classics as the stale, three divider tin of flavored popcorn. Judge away. 03. No, but the bits of NPR coverage I've heard in the morning have me intrigued. 04. I wish I was with you, because it would mean that I actually manage to read a copy of the New Yorker more than sporadically. I recieve absolutely no periodicals of any sort except Bon Appetit, which was subbed in for my beloved Gourmet subscription. I think I'm traumatized by the piles of highly worthy, but nonetheless space consuming, periodicals that have lived in stacks all over my mom's house since I was kid. I'm afraid of opening the floodgates. 02 oh those Danish tins! i'm still partial to the Pepperidge Farm Distinctive Entertaining collection, though. 03 yes! we youtubed the wee hours away one night in Germany (Mainz, i think) with some locals who were appalled/excited that we'd never witnessed Eurovision. you MUST see Finland's 2006 win. three words: stilts, wings and "arockalypse." 04 pretty much any writer for the New Yorker can come home with me anytime. i'd cook breakfast, too. also - such pretty biscuits! you'll have a fine tea party indeed. Well aren't they just the prettiest cookies ever. I don't have cookie recipes, not being overly enamoured with the cookie myself. Don't get me wrong, put some in front of me and I will eat them as fast as the next monster, but I've I'm baking myself I prefer the cake, the bun and the pudding. I'm also not entirely convinced by lavender as an ingredient. It doesn't taste a little like soap to you? 03. Of course! Eurovision, like The World's Strongest Man, was essential viewing for my Grandad and I when I was little. 02. yes, they always remind me of my mom's office christmas parties. 03. so this has absolutely nothing to do with eurovision, but you should definitely try steeping lavender in your cream for a creme brulee.